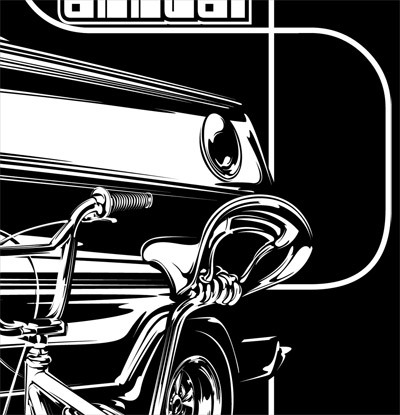 Looking at the balance of line weight, tools, design and technique in automotive illustration and beyond. "This goes back to... my obsessive need to detail everything". One of the greatest perks of my job is having fun. 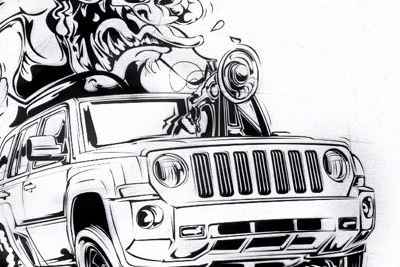 I get to have a blast when I'm drawing, even during the late-night thrashes, and times when it stops being "car drawing time" and becomes "let's see this doodle pay a bill". I hadn't realized, or consciously thought about the fun part of the equation before... It just never really occurred to me to consider it. It was simply sit and draw, erase, draw again, keep drawing until cross-eyed, rest, draw more... And then it hit me. When drawing, rendering a project, or sketching a few thumbnails to feel out a logo or whatever, it's not all about the final product. I'm having a blast in each line I'm placing on paper. Every last one of them, in fact..
...and I know them ALL by the time I've set pen, pencil, stylus or brush down. 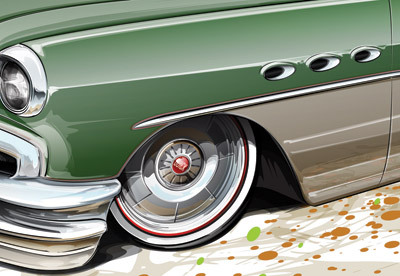 Continuing our discussion from last time, I received a number of great comments and emails regarding the obsessive detailing that seems prevalent among we car-drawing folk. It just seems to be a natural part of it all, and it's logical indeed. Consider just how complex the machines themselves are, and then imagine having to convey that complexity in some lines and pigment. A daunting task indeed! Yet... somewhere between those strokes of a pencil and color work, we have this absolutely enormous area to play in! We can take any number of roads to reach the finished product: Will it be a straightforward portrait, in which we choose to portray each and every line in a rigid, photo-real way? Or go minimalist, and work from that one body line that offers so much energy? Do we find an area in-between? Man... this is where the fun meets panic on some pieces! I was asked more than once to describe my technique, and I'll try over the next few installments, and use this as a primer for the upcoming tutorials, if that's OK. I try to convey some sense of the vehicle's personality. Not to humanize things too much, but I look for what makes a particular car or truck jump out at me. 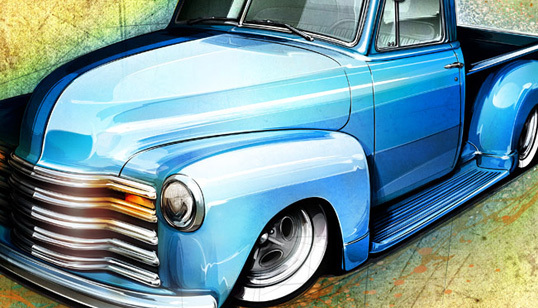 Of course, in the case of design renderings (for custom car and hot rod projects), I need to work with what's existing in some cases... in others, I play creator, and select what stays, what goes, what gets modified... And on those projects, it's all about giving the thing a personality! Now we're talking fun. I've found that the best way to do this is often the simplest, most direct route. Let the drawing speak for the car. I do this on purpose with each piece. When starting, I grab some reference material, and study the lines of the vehicle I'll be drawing (especially so if we're leaving some original panels, doubly-so when really cutting one up). From there, I look over any notes, and collect my thoughts on the project in heavy detail. I try to get a bit of the owner's personality involved, as, after all, the car tends to be an extension of that. This part of the process can really alter my approach. Are they mellow? Does the owner project an aggressive vibe? Should the car be low and slow, or angry and loud and always at full-bore? My sketch will often go along with my feelings on that (and, on occasion, the music that's playing). As the sketching starts, I use the box method to place each major component, and figure-out the space I have to work in. As I begin to rough-in the panel shapes, I start to make a few lines heavier, some lighter, and some more lively than others, varying in width and cleanliness. My goal, at this stage, is to have a visual cue for later on. I want to remember where my head was at when I put each line in there. After all, keeping the mood and personality consistent will make a more cohesive design in the end. And keeping that initial energy alive, whether it's going full analog or digital is what makes the work unique. My style always builds from this starting point. Rather than clutter-up the space with motion lines and streaks, I opted for a more unconventional approach (conventional for me, anyway... I do this a lot). I hinted at a light blur on the spokes, and imitated a strobe-like effect, doubling a few lines, and then streaking a few knobs on the tire. But what I'm most proud of here are the chain and sprocket. 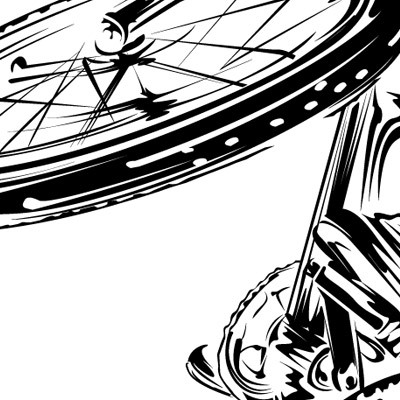 Simply varying the line a bit (inked this with a Mack 00 striping brush, for those of you taking notes... oooh), and letting it get just a bit loose, I tried to create a feeling that the pedals were being pumped, and that we froze the moment... with the front wheel closer to us, we'd see the strobe of the spokes, and moving back through space, we'd lose detail in the cranks and sprocket, but still see somewhat defined shapes as they were captured. They key here, as always, is employing your observational skills, and then putting your own artistic spin on what you see as it hits paper... Understand the physics of what's going on, but have fun in there! When painting, we have aerial perspective working for us, allowing the artist to show distance by blurring and shifting colors to blues, helping distant objects to recede...In a one-color t-shirt, by golly, we could forget all of that, and just draw, right? This goes right back to the last episode, and my obsessive need to detail everything. It doesn't stop at things like trim parts and reflections and bolts... I have this need to have some sense of space... distance... an interaction of the forms with the plane they're drawn on, and with one another. We can, fortunately, take a page from our painter's handbook, and create a sense of aerial perspective, simply by detailing and defining objects closer to us, and letting things get looser as they recede on the plane. Here, I detailed the seat heavily, and got a little looser on the handlebars (and those Mushroom grips! 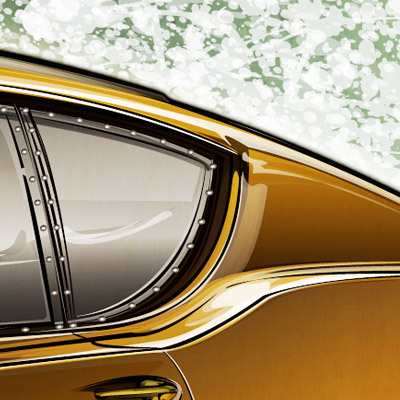 ), and simply hinted at the shape of the bubble port window, and going further back, the rear bumper just trails off... Showing just a hint of light bouncing off of the top. Doing this reinforces the effect of the van being back in the distance, as well as emphasizing that it's parked at an angle, with the rear deeper in space. Take this a step further, and pay attention to how you taper a line off, and you begin to create a visual guide for the eye... You create direction, and can move someone through your art, or direct them to an important object. No brush or filter or plug-in can do what the team of your hand and eye can do together. None. Ever. Make the most of this, then, and put a truly unique spin on your art. Create a style, and build on that style, piece after piece. Pay close attention to the lines you draw, and your ability to react to what you see through those lines. All of that by playing with lines. Cool, huh? Keep in mind just how powerful a single line can be. It doesn't simply create your art or define a piece or look pretty... the lines you draw are an extension of you. You are the only person capable of drawing a line in your own precise manner. It's like your fingerprints or signature... Unique to you, and the basis for your style, and how you draw or paint. Refine it, work with your natural stroke. I found that once I stopped fighting the way I drew naturally, and dropped the methods so pressed on me in school, that I had something enjoyable in drawing. My own style became evident. Do likewise, and you'll find your work taking you in all sorts of new directions. In my opinion (again, an opinion... I'm not knocking 3D models or vector or Photoshop-based work at all. I think that ALL ART is outstanding, and requires a TON of discipline and skill, and I use Photoshop and vector tools as part of my production, so I'm right here with you... just clearing that up before someone sends me an email telling me how they misread this and that I called anyone who build or uses Illustrator 3D models or Painter a hack, and I have to send them a link to listen to Carly Simon belt out Carole King's You're So Vain, and then re-explain that I was simply trying to describe the significant visual difference between pure analog and pure digital work, hopefully they can dig what I have to add here), what makes that work look so cold is that it's not created by the human hand, but rather by math and machine. Math doesn't observe an object like we do, and can't put a personal spin on what's being drawn or represented... Sure, you can program a filter or action to try and simulate the human action, but it can't change it all up on the fly. In my humble opinion, again, for whatever that's worth, what makes a work of art so interesting is the conflict and the way someone deciphers and then presents what they've taken from experiencing some object or event, using a pen, pencil, brush, whatever... That's not to say that any one medium or technique is better than another, far from it. Each has its place, and each requires a ton of work to learn the tools to create with, and I'm simply seeking to express my perceived temperature of one medium's result versus that of another. It's a perceptual thing, really. You may see it differently, and again, therein lies the fun and experience of all art. That said, consider just how powerful your initial lines and strokes of the pencil can be. Everything you build from that will still have that first line carrying its weight or direction. The first lines convey action, energy... or, they can be lifeless and flat. You decide! Check out the detail above. You can see that this was the result of a very quick sketch that I continued to refine, choosing to build and build on top, versus stopping to create a new, perhaps cleaner version. I just kind of liked the energy that it packed. Funny thing is, the sketch was the result of some very angry drawing. I got myself good and mad, as I wanted to make the car look as aggressive as possible. Crank some Ministry and Black Flag for six hours, drink a pot of coffee, listen to some talk radio, and off I went. 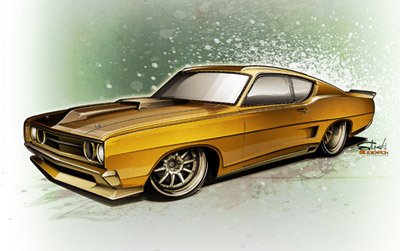 Add to that a certain distaste for some elements of the '68/'69 Torino, and what did you think would happen? What's fun here is that the lines in the sketch define the widened fenders, and play into the shaded and highlighted areas in the drawing. That thick line along the rear roof line helps to emphasize the bulk back there, but draws the eye in to see that rear spoiler. Even the gestural, angry drawings have a plan. All of my work has color built up over the original lines. This is, I believe, due in part to my studies and training in painting with oils. When applying paint to canvas, you build pigment in almost transparent layers, working from an underpainting, which creates the basic shadows and helps to define the forms. It's this application, or should I say the technique and order of the application that allows me to play, visually, with depth. As I build the color, I'm constantly stepping back to see how each new shade or highlight will play with the setting I've chosen for the rendering. Am I conveying a subdued twilight moment, or the rage and action of an autocross course? I'm constantly figuring it out as I draw. In the Torino piece above, I opted for a more serene green with a tip of the hat to Monet. I felt that the combination of raw, energetic lines and a bold, aggressive gold could benefit from a little drama, resulting from the calm background. It's this competition of soothing versus ready-to-strike coloring which reinforces the rapidly applied line work. Pay close attention in your work as you create, and consider how drama and conflict can work for you! A very mild, almost pleasant, laid-back color scheme in the greens and beige, but what's that? Some red in the wheel and pinstripe?! Hell yes. Contrasting colors can add instant drama, and here it not only helps to emphasize the edge of the wheel lip and add some pop to the molding, but it hints at the performance lurking under the hood (in this case, it's a twin-turbo Nailhead). 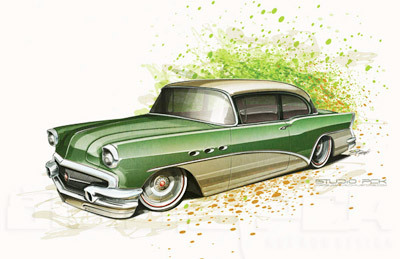 When designing, consider the original car, and compare that to your plans for it. A mundane sedan can benefit from a great stance, but the right colors, and drawn loosely and at a dramatic angle, well... look out. The groceries have never made it home so fast, or with as much attitude! A last point for this installment (we'll pick this up next time with a discussion of composition, and the elements to master therein) is working in a rhythm for your drawing. Much like the Beatles made a killing using a simple rhythm in their songs, the way those songs were written also showed a set rhythm. Your line work and color application should be no different. From the first lines you drop in, get thinking about how the eye will move through the image. 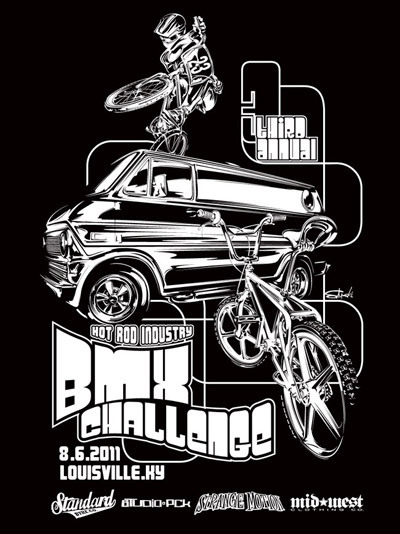 Make a mental list of the cool details in your ride that demand some extra attention, and build toward them, varying your line weight and direction to hit a crescendo at those particular features... Give a little action to your highlights, allow them to "dance" across the paint, flowing toward each perpendicular line (i.e. across the fender to the door gaps). This adds visual interest, and even hints at the setting of your rendering playing into the vehicle.